Expanding upon the previous tutorial where we learned how to connect a PIC to a host computer, we are now ready to actually program the PIC. This tutorial explains that process. To erase a microcontroller you’ll need a programmer or something that is able to communicate with your microcontroller. Erasing a microcontroller is virtually the same thing as re-programming it with no data. the Tiny ICD2 Pic programmer?. Is it possible to connect the serial cable straight to the development board to program the chip without using the Tiny programmer. I see there is a serial socket on the board. I want to know that is this developement board available in India?? where could I find the addresses of the ports of the mcu? 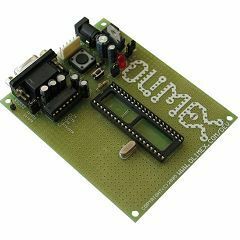 Is there any manual available for OLIMEX Developement board? the only microcontroller that I can get is the ATmega16 microcontroller with its programming circuit and softwares. so can u help me on programming it using the AVR studio4. or can u inform me how to convert the program that u have used in PIC18F452. i don’t have PIC but i have 8051 contoller, so tell me i programmed on this chip (8051)? I am using dsPIC33EP64GP504 can we code it using Mplab can i cant find it in select device i have 8.56 version of the software plsease help. Can I buy this already made???!!!! i am working on short range personal radar. i am getting problem in programming please help me. Please send me some data which will helpful for me to understand programming or please me hex code.